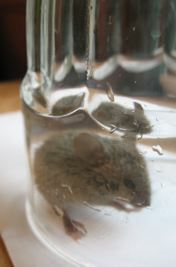 In Aug 2008, after one little mouse got injured in the trap and two others died, we stopped using this trap. The injured one tried to force his way out of a gap in the metal and badly cut his face. I attempted to fix that problem by hammering the metal side to narrow the gap. One of the mice that died was due to the trap being moved too quickly. The trap can trip if giggled, causing a mouse trapped inside to jump at the same time as the trap rotates. Fortunately, he was instantly killed because the device slammed his neck. But the other mouse that died got crushed mid-body in the rotating mechanism. We found him later, so no idea how this happened. The clean up was not fun. After this happened I spoke to the manufacture and was told to make sure the trap is wound 8 to 10 half turns. Not too few and note too many. But he said that he couldn’t guarantee that mice won’t die. It does happen occasionally. We gave the trap another try as there were getting to be quite a few mice in our kitchen. Right away we had a problem. The first mouse to be caught tried to squeeze his way through the slight gap between the baffle and the side wall. See photo. This mouse died trying to force his way through a small gap in the metal. So we stopped using the trap again. The distributor in Toronto, who I also contacted, had mentioned that “the speed as to which the mouse is traveling through the device” is variable and can lead to a failure. I came up with a solution to both of these problems (the gap, and mice moving too quickly) by adding a small piece of metal to each side of the trap. See photos below. I put the trap back into commission and over the next several days caught six mice with no casualties. A small piece of sheet metal was screwed to each side. This is a view through the tunnel. 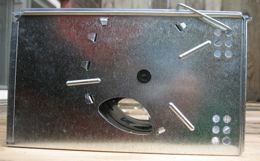 Mice are now restricted from running through the trap too quickly, and once they are trapped inside, the added metal pieces prevent a mouse from trying to squeeze out. If you are going to use this trap, make sure to check it frequently, and when removing a mouse, move the trap gingerly outside without knocking it. We put the caught mice in a tall white bucket before releasing them. Also be sure to modify it by adding two pieces of sheet metal to each side, attached with 1/2 inch sheet metal screws. Very easy to do. I have also contacted the manufacturer about this, so hopefully the design can be modified eventually. In our first conversion, the manufacturer suggested a more humane (and apparently equally effective) trap called the Pro-Ketch. It has no spring-loaded parts that need winding. Instead mice squeeze through a one-way door. This entry was posted in Animals, Uncategorized and tagged Mice, pests. Bookmark the permalink. You care too much for animals that couldn’t give another thought to you. It’s very common, humans looking after animals. Given the opportunity, animals would not think twice about eating you, or killing you for survival. Releasing the mice, they’ll probably come back or go and disturb someone else, who will probably kill them. There are billions of mice in the world, they are certainly not endangered. We have too many starving people in the world to be buying fancy gadgets so that the cute mice don’t die in your vicinity. Blunt, I know. I hope I didn’t sound too rude. I just saw a mouse in our house and I don’t want to kill it, but it’s a repeating problem, year after year, scratching, poo drops, eating food boxes..
TJ, you raise some good points. For more of a discussion on this see Veg.ca’s excellent article called Dealing with mice and rats: A humane approach to pest control. If you decide to kill them go with quick kill traps, and not glue or poison. The ultimate solution of course is to seal up all your cracks. If there are billions of mice and too many starving people I think you just came up with a solution… Mouse Kabobs… MMmmmmmm. This was very helpful. I don’t want mice to suffer and while I am ok with them dying quickly I don’t want to deal with dead bodies. Dead mice freak me out more than live mice. I will look for the Pro-Ketch.